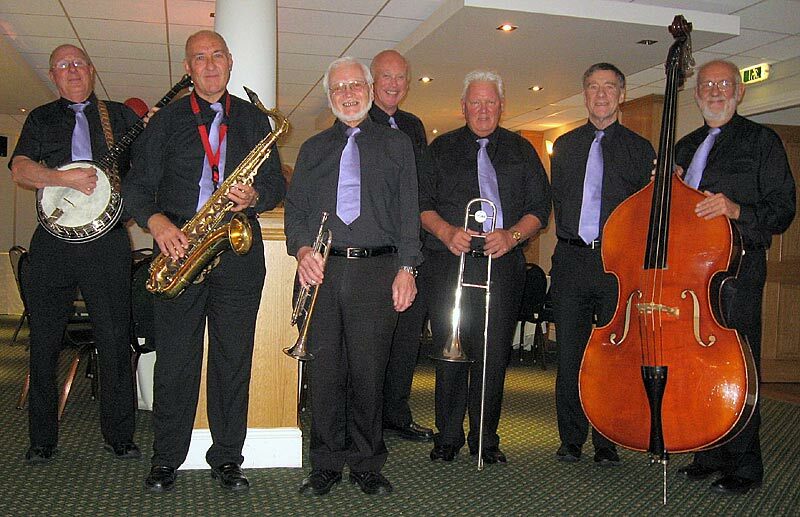 The Forest Jazz Band can trace its beginnings back to 1984 when Jack Moore and Keith Simkin watched and enjoyed traditional jazz played by the Riverside Jazz Band at The Wagoners, Burnley. Jack got himself a trombone and together with Keith on banjo, began to practise at each others homes. Eventually they found other enthusiasts willing to play drums, clarinet, bass and trumpet. Before long they had regular practice sessions every Sunday morning at The Pendle Forest Sports Club in Fence near Burnley. One day a singer, Gloria joined in and the band was formed. They wanted to name the band after The Pendle Forest, but as there was already a Pendle JazzMen, they settled on the name The Forest Jazz Band. It was, however, to be another two years before they plucked up courage to play in public at Jimmy Nelson's Sports Club in Nelson and the performance went down so well that soon the band were playing at one or two pubs in the area. Regular weekly performances began at The Crown at Colne and then various other venues, the latest being at the Union Exchange, Market Street, Colne, BB8 0LL every Tuesday starting at 8.30pm, in what is affectionately known as the County of Louisiancashire.